So I’ve lived here in New Jersey for many years and never once have I ever seen these before. I thought I would put a quick blurb out about them because well my wife grabbed one by accident today. Apparently if you grab one of these suckers they are very painful. The Saddleback caterpillar is just one of the many different insects that live in New Jersey. For the most part you don’t come across to many poisonous insects here, just goes to show you, you never know what is hidden right under your nose. Acharia stimulea (Clemens) is a limacodid moth, or slug moth, best known for its larval growth phase. Distinct bright color patterns and the presence of venomous, urticating spines lead to its recognition as the saddleback caterpillar. It is native to a large range in the eastern United States and able to feed on a wide array of host plant species. This species can survive well in northern temperate areas and warmer southern climates. 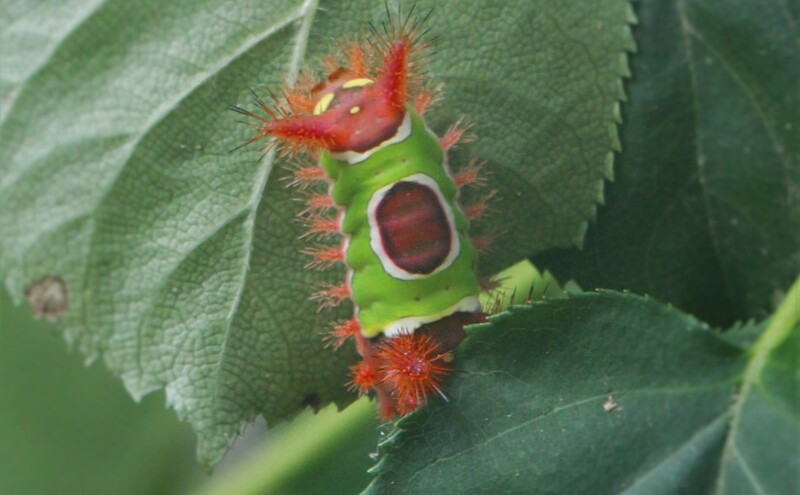 The saddleback caterpillar is encountered most frequently as a medically significant pest, and has minor effects in landscaping and agriculture. IF you have any run in with these saddleback critters I’d love to hear about it..